BERITA GADGET - Samsung has quietly released a new camcorder with its entry-level SMX-C20UN. The most visible interesting feature is its angled lens, which as on a handful of earlier cameras is tilted 25 degrees off the horizontal axis with the camera's own body. This, Samsung says, is to make holding it more comfortable by reducing stress on the operator's wrist. The camera records still and moving images onto SDHC memory cards and has no internal storage of its own. 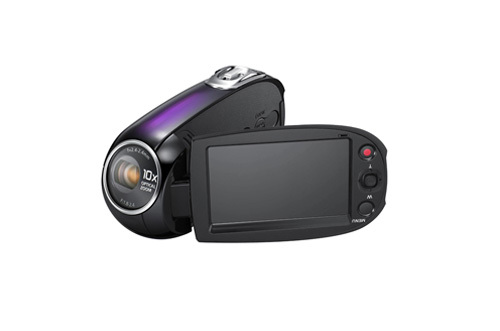 It records in the H.264 video format and uses a 1/6-inch, 680K CCD sensor along with a 10X optical zoom lens. Users frame or review their videos and images using the 2.7-inch flip-out LCD. A quick transfer feature lets users upload content directly onto their YouTube or Flickr accounts. There is also the ability to perform time lapse recording, so users can film a growing flower or other time-consuming event without being present for it.